Muslim scholars Zaid Shakir and Omar Suleiman talk to audience during a Q&A session moderated by University associate chaplain Tahera Ahmed. The two speakers emphasized using faith as fuel for personal achievements. 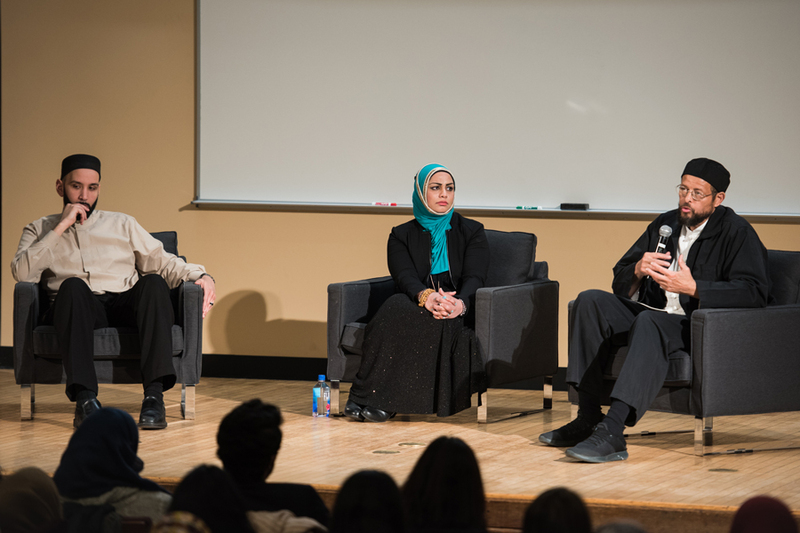 Northwestern Muslim-cultural Students Association invited keynote speakers Imam Zaid Shakir and Imam Omar Suleiman for a conversation Thursday about reconstructing the perception of achievements by Muslim Americans. During the keynote presentation of Discover Islam Week, the two scholars advocated the use of faith as fuel for personal achievement and discussed fighting for greater social justice. The keynote, held in Lutkin Hall, was followed by a Q&A session with an audience of more than 200 and moderated by University associate chaplain Tahera Ahmed. Shakir, who is black, told the audience that if they are passionate about Islam, then racial discrimination or other adversities should never impede their pursuits of spirituality. Shakir said success is a “function of passion” and alluded to Malcolm X, a black Muslim activist during the civil rights movement. Shakir, who is recognized as one of the top 500 influential Muslims by The Muslim 500, encouraged the Muslims in the room to use hardships from their past as motivation to achieve greatness, which he said will in turn reshape the collective narrative of Muslims today. Suleiman, who spoke after Shakir, said tragedies should not weaken one’s connection to God and faith in the world, but instead that people should use Islam as a reservoir for activism. Suleiman, founder and president of the Yaqeen Institute of Islamic Research in Texas, directed the Islamic Circle of North America’s “Muslims for Humanity” relief effort following Hurricane Katrina and has volunteered himself as a resource for Syrian refugees. NU alumnus Najim Yaqubie (McCormick ’12) told the Daily he thinks the outward projection of faith as social activism is especially important in the contemporary context. McSA president Sarah Khan told The Daily she was pleased with the event’s turnout, and said it is important to bring Muslims in the Chicago area into one common space to talk about their faith. University of Chicago junior Afreen Ahmed heard about the presentation from her friend who attends NU and told The Daily events like these are important for religious conversations.